Clear to me are sleep overs (birthday ones, if memory serves right) where JAL and others would construct lego dreadnaughts with one purpose... to drop them on your opponents! The last one to have his lego man disloged would be the winner. My finest voice acting moment, as we recorded the event. I do love the Legos, but yeah, I'd hate to find out how many little plastic pieces Lucy would ingest before we'd have to cart her to the doggy ER. If you guys start adding bookshelves for Lego stuff now, I'm getting Jamie a Tinkerbell outfit. I don't think we need to worry about that. (a) I can't afford Legos. (b) The fun isn't in building them and leaving them assembled. It's in building bigger and cooler stuff all the time with your pieces. But, I don't want Lucy and Jeff choking on Legos, so we're not buying any, anyway. I love lego! I probably had thousands of dollars of lego when I was a child. I think I ended up donating them to charity when I was in university. On one hand I'm happy with that decision but on the other hand my daughter is about to turn 4 and I'd love to have them back right about now. Recently announced is that TwoMorrow's publishing is starting up a new lego magazine, Brick Journal in February. Also, Boing Boing is always posting some cool lego stories. 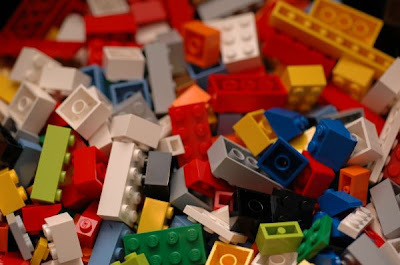 I love Lego too, but my bare feet never did.